GWAS 2015 BEST LUSTER AWARD! 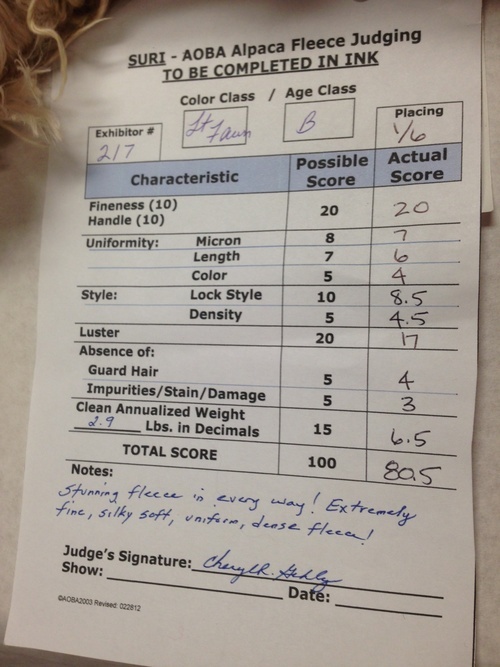 MAX is the perfect Suri Male, that is what 7 Judges said. He is very, very dense, with lots of luster and a good conformation. Nice uniform locks. He has a great dispostion and is a real gentleman to the ladies. 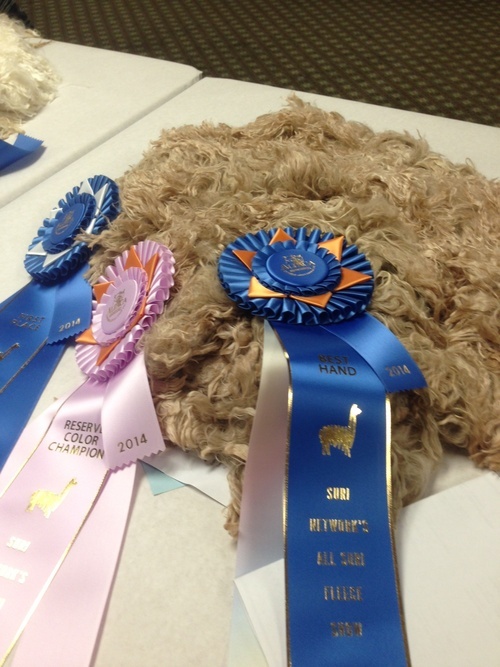 He is the only Suri to have been shorn who took the Championship at The Futurity in a full fleece class. His first offsprings are in the show ring this spring. 2 Boys took a 1st and 2nd in the Large Processor Class at the IAO. CALIF CLASSIC ALPACA SHOW 2 FIRST 2 SECONDS 2 COLOR CHAMPIONSHIPS AND A 6 MONTH OLD WHITE FEMALE TOOK BEST OF THE SURI FEMALES. Book your breedings now and have an outstanding cria next year. This girl is a multi-CHAMPION and stunning in every way! Her dad is a Futurity Champion and she is now breeding to many time Futurity Herdsire of the year Chakotah of CCR Suris! 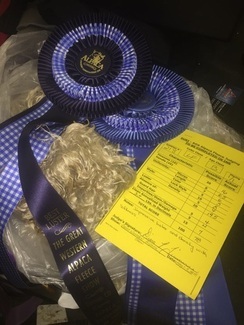 Senior AOA Judge Cheryl gave Pear Blossom a 20/20 for Fineness and Handle at the Suri Network All Suri Fleece Show last August and said "I now have a new benchmark of fineness and handle to compare other fleeces to!!!" WOW!!! Pear is pretty remarkable! RGSA Rogue's Pear Blossom is poised to be the "DIAMOND in the rough" in any Serious Suri Breeders Foundation Herd! She is one of the best females born at Rogue Suri Alpacas in 2013! 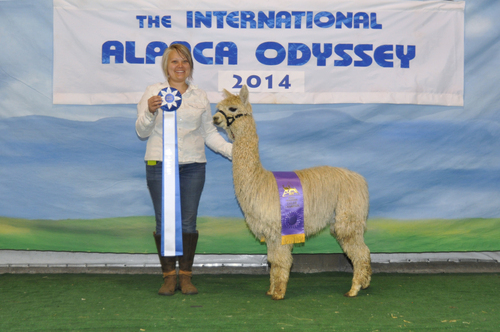 Her concentrated genetics boasts the most prominent and potent Alpacas in the USA! She is one of very few females offered on the market today with 3X Bruxo Lineage! 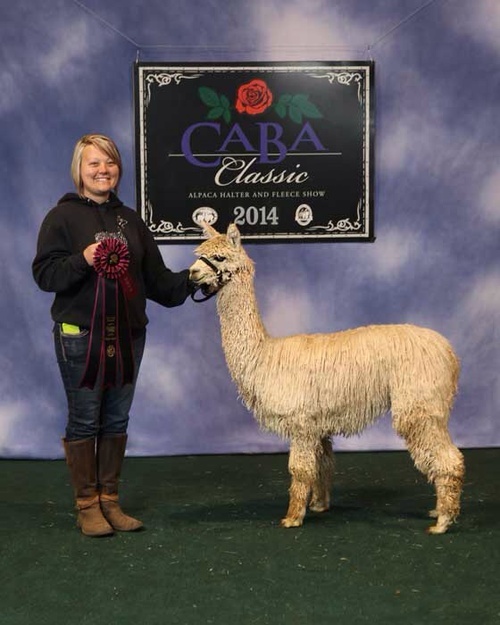 Her sire Sierra Bonita's Maccoyo Maximum, out of the famed Sierra Bonita Alpacas, won Color Champion at Futurity as a SHORN yearling! Her mother Derwydd Peruvian Tintiy is a daughter of Derwydd Accoyo Ch'aska, a Fawn Full Accoyo Bruxo son, is an absolutely stunning foundation female here at Rogue Suri Alpacas! 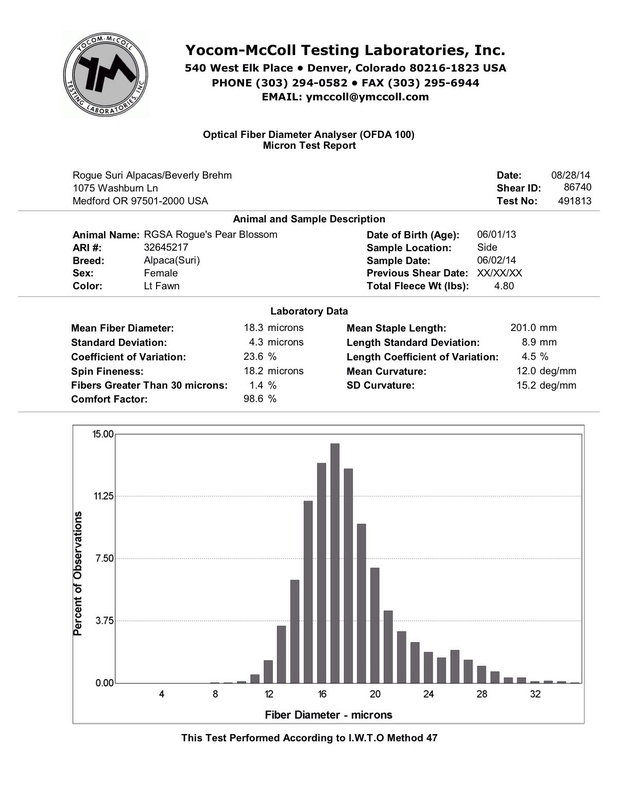 HHSF Peruvian Patientia, Pear Blossoms maternal grandmother, even at 13 years old has amazingly fine fleece and is still #3 of 6296 for AFD in the EPD's 2013 Calculation!